Are you looking for the best tool kit for home use? In fact, let us put it this way! Toolkit at your home is an essential option for a host of minor repairs that you can carry out on your own. There are several advantages that a household toolkit will offer you. It can be helpful in several minor tasks like dismantling or assembling a UPS or several home appliances. With a massive list of starter toolkits for home available, isn’t it a good idea to check out a few best tool kit for home use in India? But, before that let us know what exactly one should consider before buying a toolkit for home use? 2 Who makes the Best Hand Tools in the World? As usual, before we can check out the best toolbox for home, you have at your disposal and our top five picks among them, let us understand the points you need to take care of before making an actual choice. A mini buying guide of sorts, here are the five considerations you need to go through if you want to buy the best toolkits for home use in India. Being indecisive is what you will find as the most significant deterrent for the best buying experience. From that perspective, we will check out the best tips you need to follow before you finalize an option for your needs. The quality of the material used for the toolkit and components therein should be a prime concern. Buying a low-quality product and finding it is not worth the efforts may not be a great idea. The material used should be corrosion resistant. Tools which scrape off after prolonged use are something to go with. One of the things that can be checked for tool kit quality is meeting the ANSI, DIN, etc… standards prescribed for designing this product. You are not professional, and you are looking for the toolkit that can get the minor jobs at your home get done. So, a professional level tool that needs a vast amount of learning and specialized training may not be something that you are looking for. A kit that meets the need of simple household repairs and offers higher value in terms of functionality should be the prime option on your list. The purpose for which you have been checking out the tool should have a more significant bearing on your purchase. If you have a slight professional level of expertise, you can go a for a slightly advanced tool. Think over how you would be using the tool before actually buying the kit. The grip is an essential factor one needs to consider before buying a kit or tool. In fact, buyers often tend to underrate this aspect. After all, the tool should be comfortable in your hand so that you can get your task done. Choose the grip that best meets your exact needs, and how you handle the tools. This can often be subjective in nature. Of course, the tools you are buying may be great in themselves. But, what about the toolbox that it comes with. Make sure that the box is decent enough. The tools should be arranged in an organized and compact manner. The toolbox should have a proper handle to make it portable enough to carry it along in case you feel it is needed. Who makes the Best Hand Tools in the World? 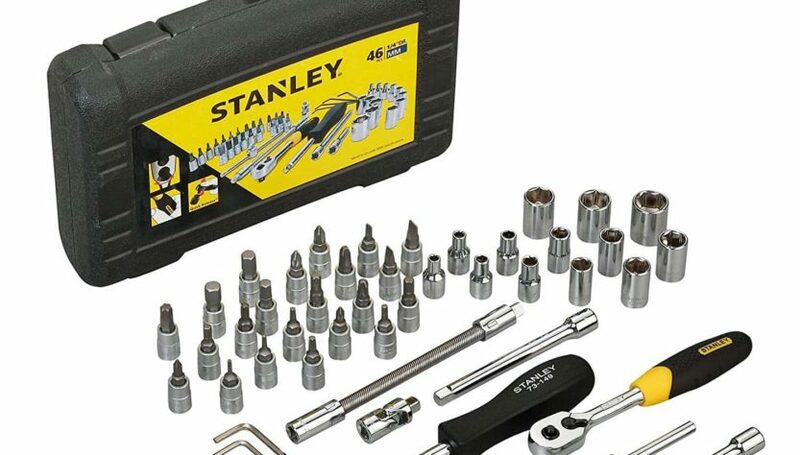 Popular brands like Stanley and Black+Decker are the best hand tools manufacturers in the world. They meet all the desired quality standards in their products. Both these manufacturers come with a set of wide range of tools in a toolbox meeting all the requirements of the user. The user merely needs to understand his own requirement and get the best tool kit for home use or any other use as per the requirement of the user. These brands have gained super fame in the tools market and are the best of the few who makes the best hand tools in the world. There are also other brands like Crescent, Cartman and many others. Having gone through what you should look for in a toolbox for home, why not move ahead and check out the best all in one tool set for the best DIY experiences? So, here are the best five toolsets to buy. 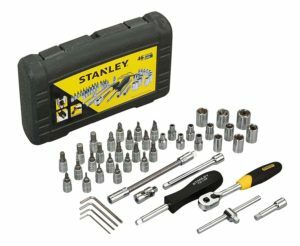 Stanley STMT72794-8-12 1/4 Drive Metric Socket Set stands proof to Stanley that has been a name to reckon with for over 170 years and lives up to the trust it has been able to build over the years. You can trust the quality, durability, and safety that the brand has been known for the world over. The 46 piece set has been known to provide you with an all-around performance to meet almost all your requirements. You have access to a host of tools right from quick release ratchets, drive extensions, universal joints, sliding T-bars, to spinner handle, and hex keys. The toolkit is made from high-quality steel. The grip design is comfortable for most of the requirements. The thin head allows easy access to tight spaces. In addition, the locking mechanism makes you work more safely and productively. The double nickel-chromium alloy coated tip makes it corrosion resistant and durable. Lifetime warranty for any of manufacturer defects. Patented gripping giving a very comfortable usage. Meets ANSI and DIN standards. Q: What is the length of the ratchet handle? Q: Can it be used for Allen bolts? A: It can be used to fasten or loosen Allen bolts of select sizes. 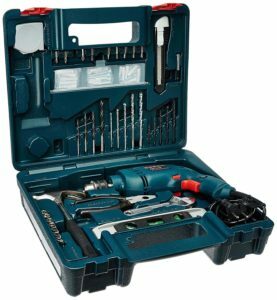 Bosch GSB 500W 10 RE Professional Tool Kit is an excellent option if you are looking for the critical tools for any repairs or general maintenance. This is professional drill set and along with a host of additional tools like screwdrivers, hammers, etc. It is the best toolbox for home repairs. The toolkit is compact in design, and it works best for both professionals and amateurs alike. The 500 W motor should be capable of handling practically every task you would throw at it. The compact size will help you work with it even in the smaller and constricted spaces. The toolkit comes with the claw hammer, screwdriver bits, adjustable wrench, spirit level, adjustable knife, metal and masonry drills, and a host of other tools. You have access to a 100 piece toolkit to meet almost all your repair requirements and are made of standard materials that do not scrape off. This can be one of the best all in one tool set for home use due to a wide range of tools available in a single box. Compact for working in tight spaces and overhead. Easy to use and suitable for both professionals and amateurs. The toolkit can be a little expensive compared to the alternatives. Q: Can the machine be used on concrete? A: Yes, the machine can be used on concrete, wood or metal. Q: What is the type of the drill? A: It is a hammer drill. Magnifico Bj-196 Plastic 8 in 1 Multi Screwdriver Set comes with all the tips you are looking for almost all your requirements. This can be one of the best tool set for home. 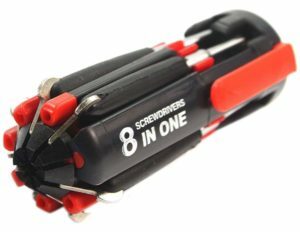 The eight pieces multiple screwdriver sets come with a flashlight as well. The flashlight will help you work with ease for the constricted places without having to worry about the external lighting arrangement. The easily foldable design is what makes it an exceptional choice for the portability. This screwdriver set is one of the best options for working in a tougher working area. It is an amazing tool set for home use for the given price. Comes with a flash light which has high brightness and stable high beam. Sufficient range of screw drivers for home use. Super portable due to its foldable design. The product comes with no warranty. Q: Does it have a magnet? A: No, it is a normal screwdriver. Q: Is it accompanied with a tester? A: No, you have no access to a tester. 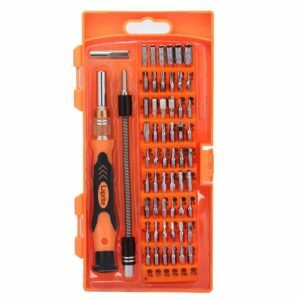 Laprite 58 In 1 With 54 Bit Magnetic Driver should be one of the best starter tool kits for home if you are looking for a magnetic toolkit for household use. The magnetic driver bits and sockets can be quite handy when you are repairing the items like MacBook, Cell phone or other digital products. It comes with an extension bar that helps you extend the length of the handle by up to 9 inches which enables you to easily remove a screw stuck deep. Also, it comes with a flexible shaft that can be used to bend arbitrarily to reach inaccessible spaces. The toolkit comes with a compact design and provides for a convenient transportation. The supreme chrome material and the perfect heat treatment can go a long way in terms of durability. This toolkit can be an excellent option for repairing smaller appliances in the house. Made of supreme chrome- vanadium steel. The grip offered by the screwdriver helps to use the sturdily. Comes with flexible and extendable bits. Q: Are the tips sturdy and capable? A: Yes, the design is sturdy enough. Q: Can it be used to open computer hard drive? A: Yes, you can easily use it to open computer for hard drive, for replacing it or for converting SATA to an external hard drive. 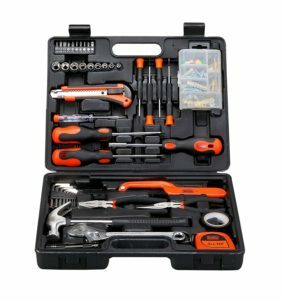 BLACK+DECKER BMT126C Hand Tool Kit coming from Black & Decker should be the prime option among the best tool sets for home. Also, Black+Decker is one of the best manufacturers for the tools in the world. The DIY kit comes with almost all the necessary tools that you have the need for your home repair requirements. As the name itself should be indicative, it offers you a 126 piece toolkit. The kit is compact, stylish and offers you a complete assortment of all the necessary tools you will need for your day to day tasks. 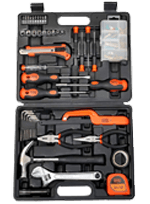 Black & Decker toolkit comes with screwdrivers, precision screwdrivers, pliers, hand saw, adjustable wrench, claw hammer and other hardware. It offers you a really advanced toolkit for home and office requirements. An excellent collection of assorted tools for all needs. The tips fit in slots and do not come off. Suitable for any kind of repairs. The screwdriver should have a been a bit longer. The quality of the case isn’t great. Q: What major items does it come with? A: Some major tools included in the kit are Claw hammer, Adjustable Wrench, hand saw, nose pliers, cutting pliers, 4 precision screwdriver, 2 screwdrivers, ratchet driver, drill bits 10 nos & Sockets 9 nos, torchlight and hardware 82 nos, tester, insulation tape, measuring tape, hex keys 8 nos, cutter, and the case. Q: What is the size of the opening of adjustable screwdriver? A: The opening is around 2 inches. With the availability of practically huge number of tools and toolkits, it may not be easy to find the best option among them. We went through the options of the best top rated toolkits for home use in India and listed the best available options in our top five picks. You can go through the above compilation and opt for the option that best meets your requirements. Have you used any of the toolkits featured here? If you have checked any of them, or if you prefer any other tool kit for home use than the above mentioned, then please feel free to share your views with us in the comments below. My brother likes to be his own mechanic sometimes and he wanted to choose some starter kit. I searched on net. Everything was coming for foreign countries. At last this post saved me because it has described the starting kit which is available in India. I suggested this article to my brother and he found it really useful. Glad you like it, Savita.